I'm new on this forum, and a new user of this awesome FW, and I'm already loving it! I've got a Iaudio M3 and a Sansa Clip +, both rockboxed, and both have the same king of usage which is probably not so frequent: I'm listening to MP3 at work, and thus, the player is continuously connected to USB to charge. On my M3, I've used 3 batteries: all dead with only a few charge/discharge cycles, because it stays always at 100% SOC (State Of Charge). In order to maximize the battery life, it could be very great to have the opportunity to select a 'connected mode'. 1. normal mode, to charge the battery in order to use the player in a normal way. 2. desk mode, on which the SOC target could be set to @40%, in order to preserve the battery. I doubt its going to make much difference to keep the battery less charged. At least on the Clip+, charging stops when the battery gets fully charged, even when connected to a PC. After that you have to replug it to start a new charge cycle. Actually I can imagine having a battery life extension option, my netbook has one (Samsung N510). In battery extension mode, it charges only up to 80% instead of 100%. In the short term, I don't think we'll see any such option on rockbox yet. It is a known fact that Li-ion and Li-Pol batteries age faster when they are more charged and/or when their temperature is higher. So option to stop charging at certain level and possibly to not start charging when the charge is above certain level would be useful. Dependency of aging on the number of charge cycles is not clear but from my experience it seems that avoiding large number of partial charges makes the life of a battery longer. It *is* true, however it doesn't matter very much. It's only a big deal when the battery is stored for a long time without being used. If you're actually using the player every couple of days then it's not going to spend long enough fully charged for it to make a lot of difference to the battery's lifetime. In general, for real devices that users use every day, you can do anything you like when you charge it (charge it often or not, fully or not, leave it plugged in when charged or not) and the result will be absolutely no observable difference whatsoever. This really only matters for things that are infrequently used. If you have long battery life and you plug in the player daily (eg. in a car or playing music via a dock at home), then the battery will probably spend most of its time near full charge and wear out sooner. It would be nice to have a charging level limit for such situations. There should be some hysteresis. (The level required to re-start charging should be a few percentage points below the level that ends it.) This should also exist in the normal case, when charging to 100%. Even without this, the battery should still last for a few years. If it dies after a few charge/discharge cycles, then it was probably defective, low quality or abused in more serious ways. I don't think it makes sense to worry much about battery level micro-management, but the point here is that it's a feature you can simply set and leave until you need more capacity. Thanks a lot for all your feedbacks! 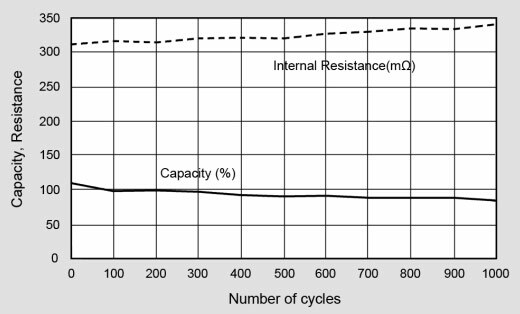 I'm working with lithium batteries, and using LiPo in remote controlled cars, and i can tell you that the extreme charge/discharge levels are bad for battery life. For example, in hybrid vehicles with LiIon batteries, the usefull range of SoC et 30-60%. When driver see 0%, the real level is 30, and when fully charged on dasboard, real charge is 60%! What would be a reasonable way to charge to a lesser extent? Just adjust the max. charge voltage to a lower value (and keep the current settings the same)? As far as I've seen with many Sansa players, the useful voltage range during use is from about 4.1V to about 3.6V, or a range of 0.5V. Currently we charge with a voltage limit at 4.2V, so would charging up to 4.1V to get at 80% (for example) with the same current settings be reasonable? RC cars, and real cars, have drastically different load characteristics to portable consumer electronics. The effect really is a lot less than you think. Why not introduce a parameter to select the balance between Autonomy vs battery life? This is just a suggestion of values, it needs to be discussed. But I like the balance parameter. It's easy to set for the user, and a good way to adjust according to everybody needsâ€™. I'd like to add one remark: I was wondering why I've never seen any Li-based device having this kind of parameter. But is i quite obvious: for manufacturer, the only interest in battery management is to show that a brand new device has a big autonomy. If the battery life is short, it's even a plus, as the customer will buy a new one! What king of charge is used in Sansa? Do we complete a full charge with a small current? Or do we stop as soon as the voltage reach the target? Could we also play with this? Could you explain the differences please? Or provide a link about this? It comes down to this: there's two (main) things that reduce the capacity of a battery: the passage of time, and recharging it. A battery that's just sitting around doing nothing will lose capacity no matter what; the rate depends on temperature and on the level of charge, and indeed it will lose capacity faster if it's left fully charged. However, you're going to kill the battery in your consumer electronics through repeated charge cycles long before you notice this effect. RC cars typically aren't actually used very often; they spend days, weeks or months at a time sitting on a shelf. Mine has certainly had less than a hundred charge cycles *ever* This means that the capacity loss is dominated by how much it's lost over time, and thus it's important not to leave it fully charged when you put it on that shelf. My smartphone, for a different example, can chew its entire battery from 100% to 0% in about 20 hours if I use it as much as I normally do. I end up charging it multiple times per day as a result. Even then, it's not fully charged for a very large proportion of the time, and the number of charge cycles massively outweighs the loss-over-time effect. An MP3 player is not quite so bad, hopefully, since they are not usually turned on 24/7 and their power consumption even when in use is lower compared to their battery size, but they are much closer to the smartphone example than the RC car example. If your MP3 player lasts long enough on a single charge that you can use it for several days without charging it, then it's very likely that the best *simple* thing to do in terms of preserving its battery lifetime is just to.. use it several days without charging it. When you think it's too low to go another day without charging it, charge it. The difference between letting it charge to 100% and letting it charge to a lower voltage is pretty minor compared to just not charging it as often. Anyway, if you feel like writing a patch to control charging behaviour in this way, then go for it; I'm just noting that the effect is likely to be much smaller than you imagine, and may in fact be unmeasurable. I understand, and you're probably right. Don't know what to think about! However, you're going to kill the battery in your consumer electronics through repeated charge cycles long before you notice this effect. I'd like to know the basis for why you say repeated charge cycles will kill the battery. From BU, the detrimental effect is marginal wrt to charging li-ion/poly ceterius paribus. Normal charging should only get a Li-ion lukewarm. Whats more dangerous is fast charging and harsh discharges. Think super fast wall chargers and deep discharges. The smaller the DoD the better. That means frequent charges with small DoD is better than less frequent charges with a larger DoD. Temps are lower with partial charges than longer ones. And we all know elevated temp is the biggest battery killer. The reason i posted here is I am in agreement that RB needs a feature that allows the user to set the max charging level or voltage. Going with Table 4 of the previous posted link that is at 3.9 - 4.0V. 3.9V corresponds to 70% using this battery benchmark log . Therefore the optimal charging level is not 100% but rather closer to 70% (or whatever the corresponding voltage). If there was way to stop charging at that level via a user configurable setting then battery life could be improved considerably. charge to 70%, use till down to 45% and then recharge again. This provides a low DoD of just 25% and keeps battery stress to a minimum. The runtime is reduced to ~4 hours ( in the case of the Clip+) but that is a decent duration between recharges. Heh, no, i cannot do this. I've posted to stimulate a discussion and hopefully generate interest in allowing such a feature into RB. Way i see it it such a feature will benefit any portable li-poly device RB is installed on to the tune of 2-3x longer battery life if BU's figures are correct. I was wondering why I've never seen any Li-based device having this kind of parameter. But is i quite obvious: for manufacturer, the only interest in battery management is to show that a brand new device has a big autonomy. If the battery life is short, it's even a plus, as the customer will buy a new one! Because the consumer wants a device that will run the longest. Run time is more important than battery longevity. If batteries are really good for so many charge cycles as that chart suggests then I don't think this setting makes sense.